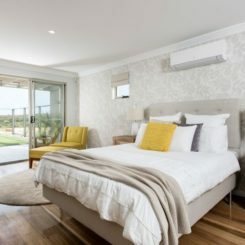 Whether you still call it “shabby chic” or have moved on to “country chic,” there’s a relaxed decor style that’s heavily trending. 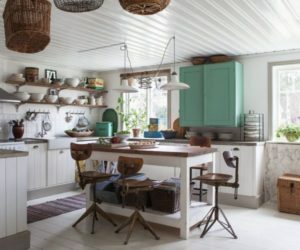 Combining standard pieces with those that have a vintage look – whether they’re truly used or just replicas — is an easy way to assemble a casual, comfortable and stylish home. 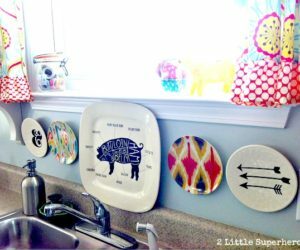 And, if you’re on a tight budget, this can be your ticket to a refreshed space with current style without having to buy all new items. 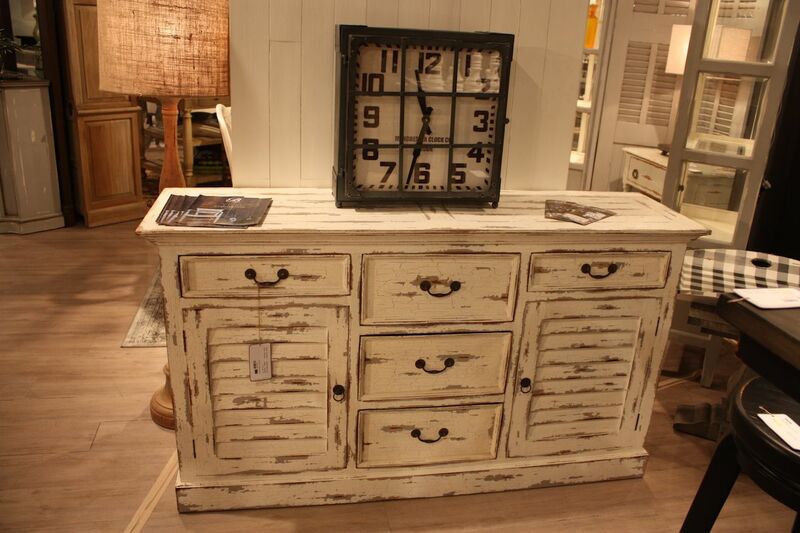 Distressed finishes are common on furnishings of this style. 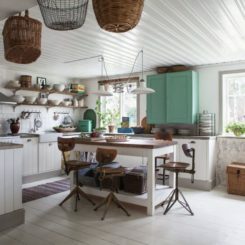 Whether shades of white or pastel colors, the roughed up, banged up paint finish helps set the tone for a vintage country room. 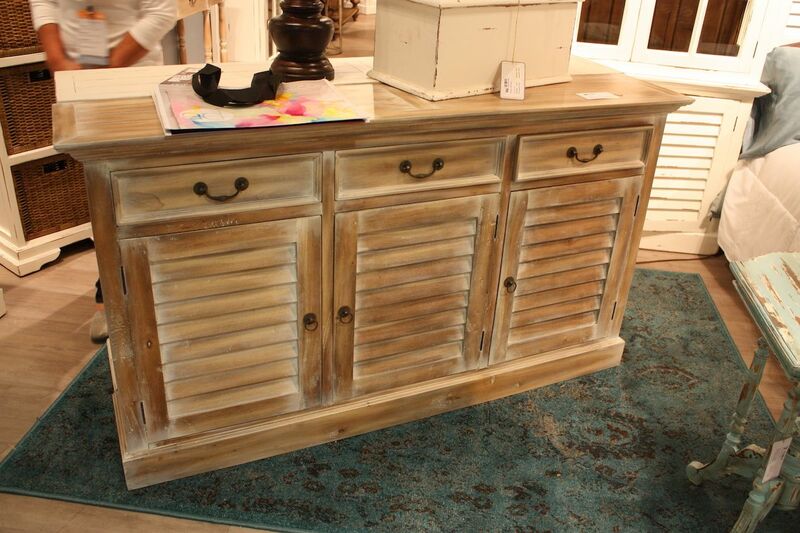 This sideboard with shutter styles doors from Bramble is customizable in finish and color. 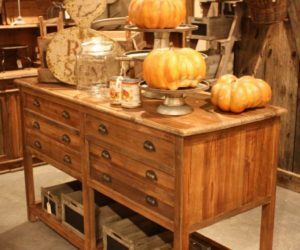 This similar sideboard is also distressed, but the dominance of the natural wood, rather than the paint, gives a slightly more refined feel. 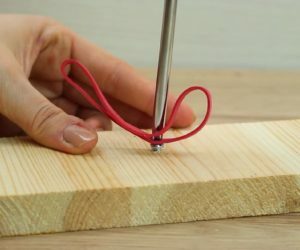 It’s a little more versatile in that it could be used to add a casual element without the characteristic heavy, repurposed feel. 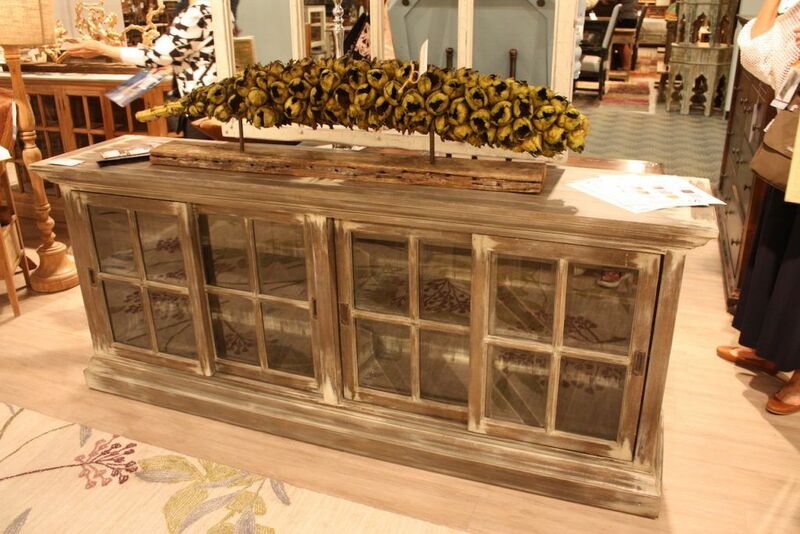 Choosing glass-fronted doors on a distressed sideboard in a pale wood gives it a vintage, old-world look without feeling stuffy. 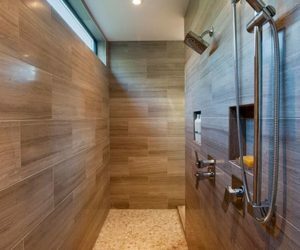 Adding a modern accent such as the natural, dried display here brings it into a more contemporary mode. 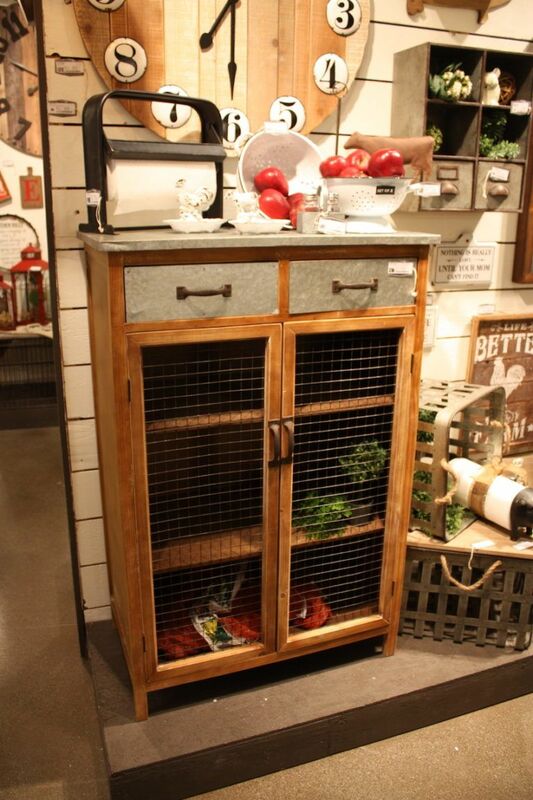 If you substitute display items that are also vintage, it will give the cabinet a completely different look. 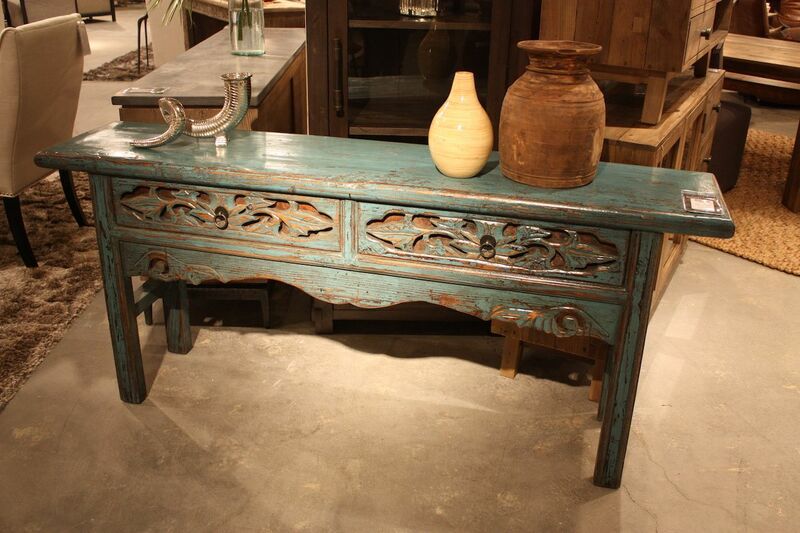 A distressed finish with more ornate woodworking details brings a fancier feel to this blue console table from Classic Home. 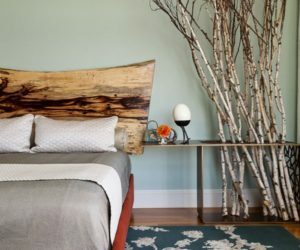 Without the blue paint color, the piece could have a more global than country feel. 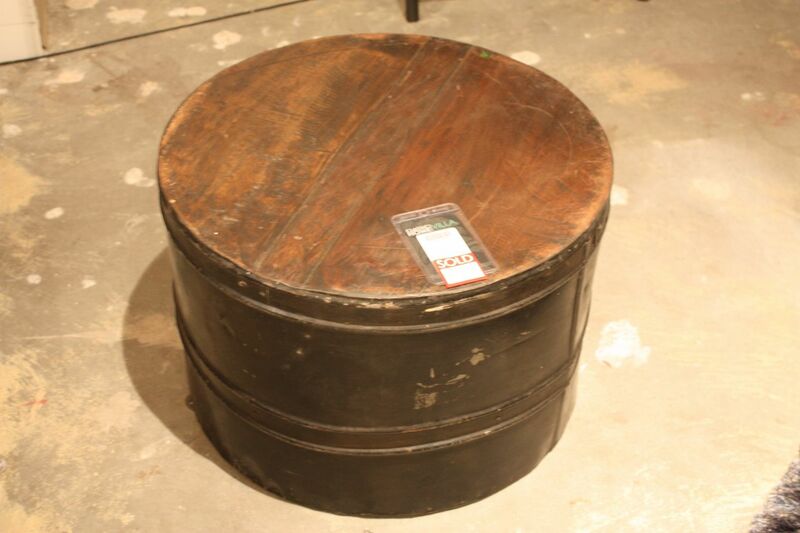 Reminiscent of an old farm drum, this coffee table made of repurposed materials would be great for adding an unexpected contemporary element to a country chic room. 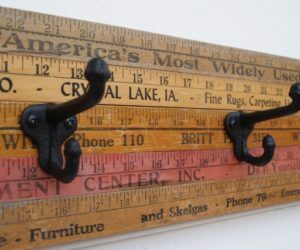 The piece from Classic Home is easy care and worry-free. 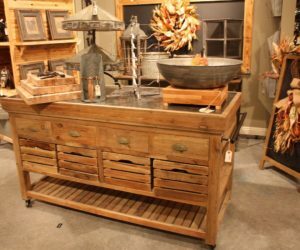 Furnishings that include repurposed elements fit right into the country chic style. 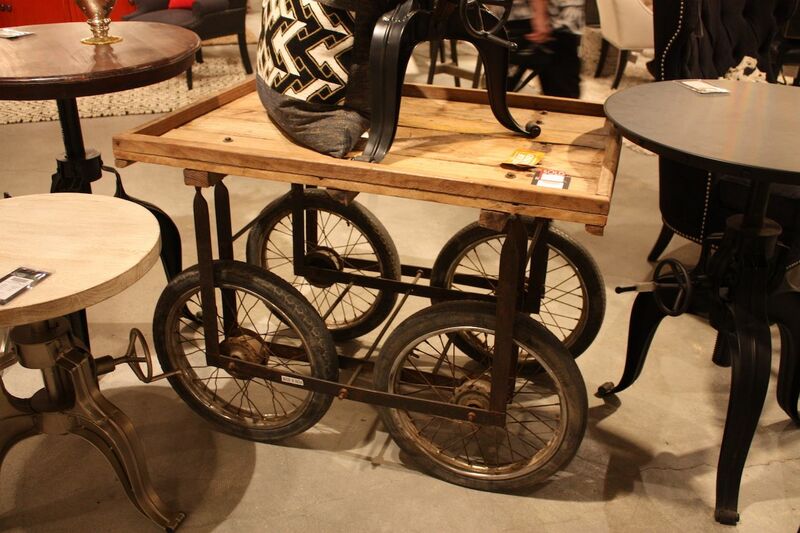 This side table has a rustic wood top that sits on a base made from old cart wheels. 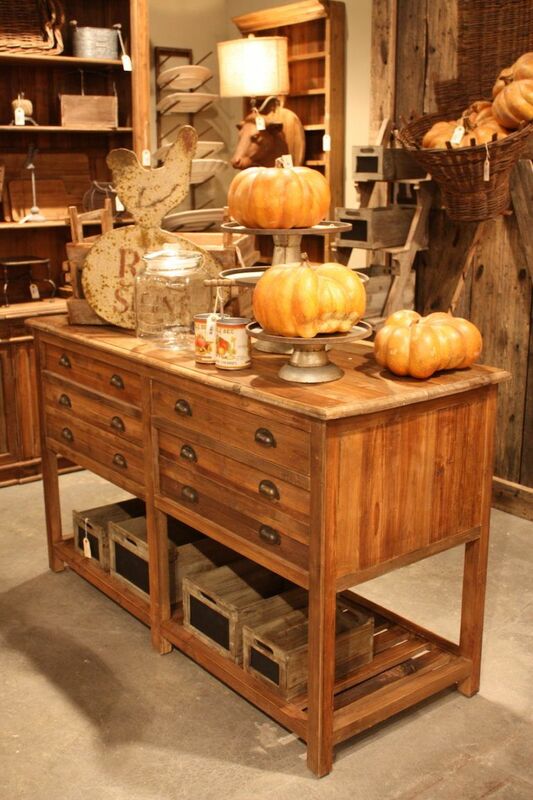 The piece, also from Classic Home, is an instantly chic, rustic addition — and a conversation piece! 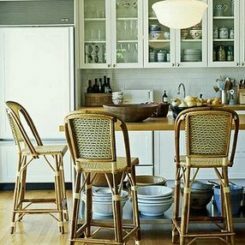 An open baker’s rack with wood shelves is a natural for a country chic kitchen. 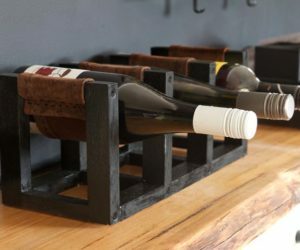 It can be used for both display and utility storage, particularly when teamed with the appropriate style storage bins and accessories. 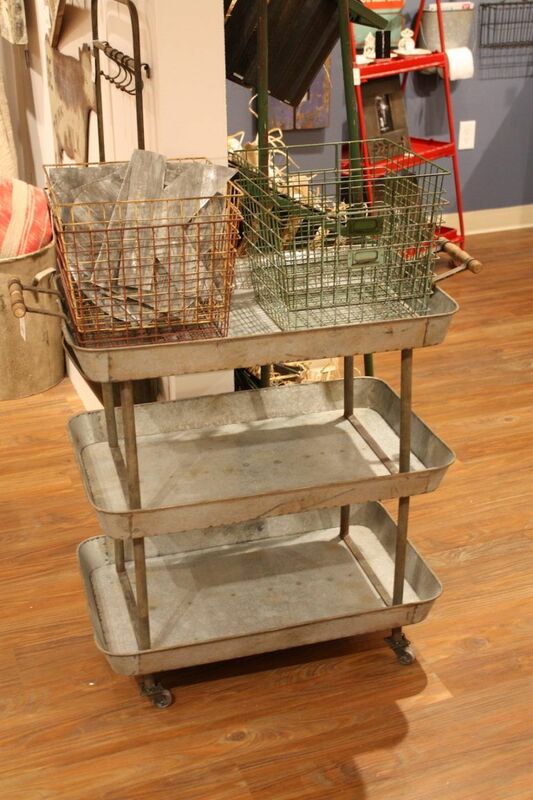 From Creative Coop, it’s especially useful thanks to the heavy duty casters. 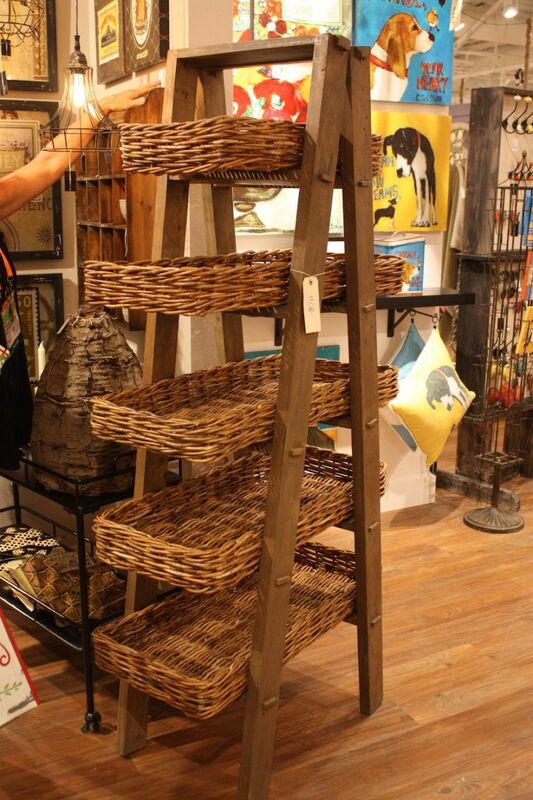 For a more farm market style storage solution, this 72″ high wood ladder from Creative Coop has five decorative trays made from arurog, a type of rattan cane. 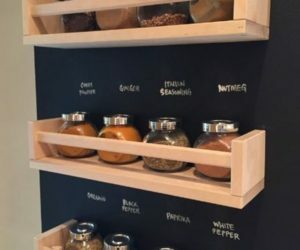 The open storage is highly decorative and very accessible — perfect for showing off staple kitchen tools or displaying your often-used foodstuffs like potatoes, onions and decorative squash. 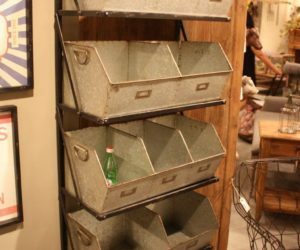 Most bar or tea carts may be too refined for a country chic decorating style, but this galvanized metal option would fit quite nicely. 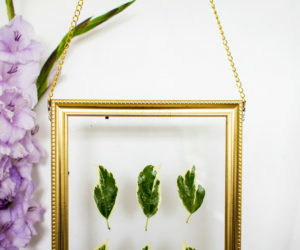 Paired with your vintage mismatched tea cups and dainty plates and napkins, it’s the perfect piece to use when hosting a casual get together. 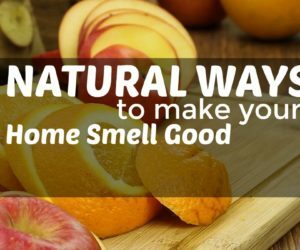 Or, roll it out next time you’re having a barbecue and serve your beer and cocktails. 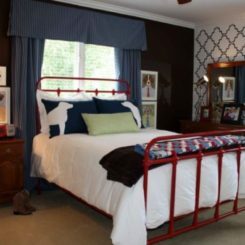 Speaking of galvanized metal, it’s another material that is often found in country chic decorating. 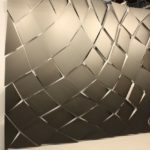 It’s popular because it introduces a metallic finish without the typical high shine and glitz of most metals. 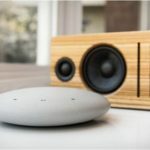 And, the matte finish is low maintenance and ages well. 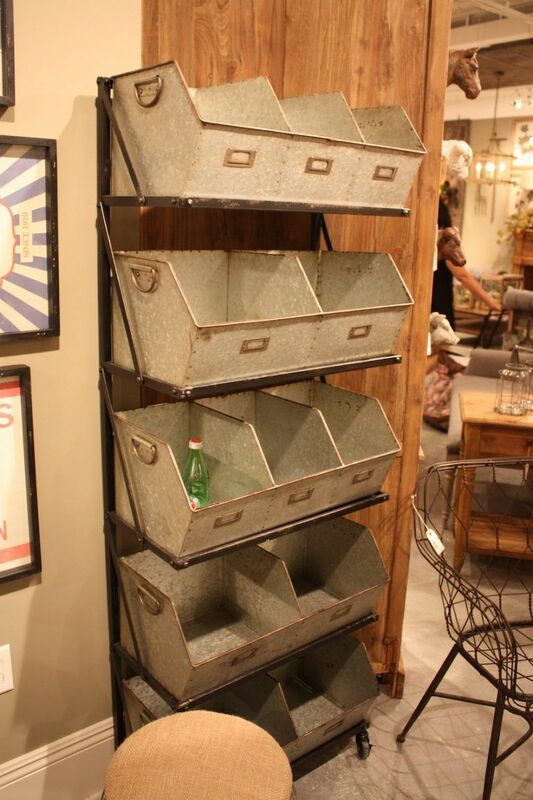 This stack of rustic metal storage bins from the Park Hill Collection would be useful not just in the kitchen, but also in a laundry area, pantry, mudroom or kids room. 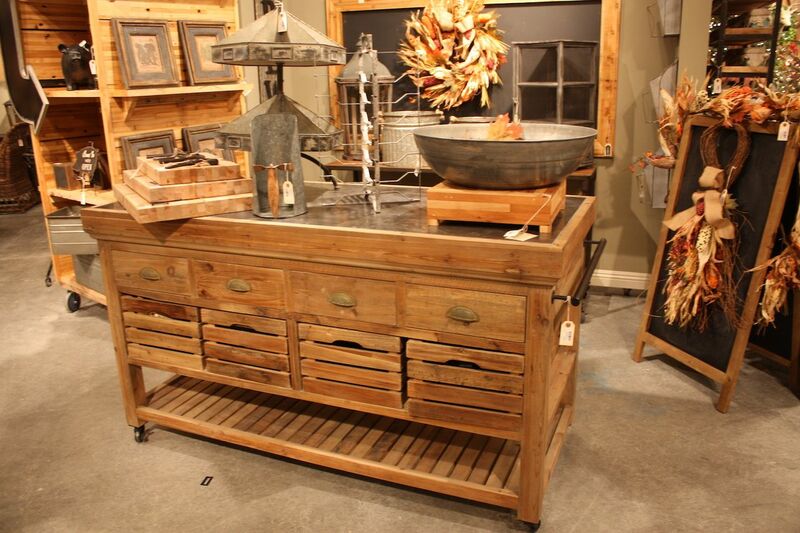 Even just a touch of galvanized metal adds the right flair to a piece of country style furniture. 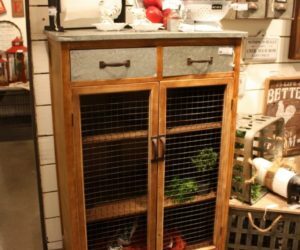 This pie safe from VIP Home and Garden combines a top and two drawers of galvanized metal with wire-fronted cabinet doors. 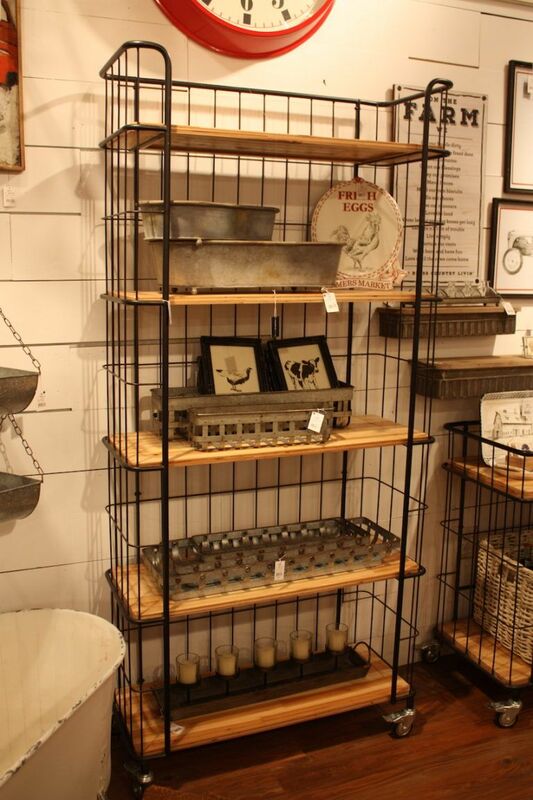 It’s farmhouse chic without being over the top and is perfect for displaying and storing all kinds of accessories. 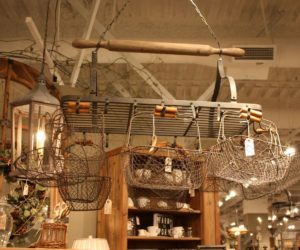 This unique hanging rack can display rustic pieces like these baskets, or could feature a few of your copper or enameled kitchenware items. 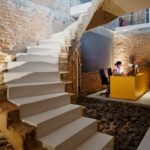 Either way, it adds an artful element that’s a little quirky and a lot of fun. It is also from the Park Hill Collection. 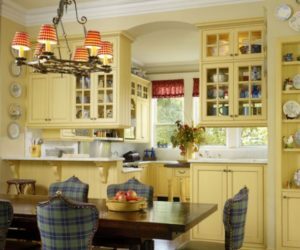 A country chic kitchen still needs an island, but a modern granite-topped counter is not going to work. 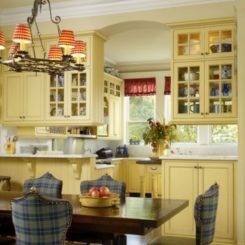 Instead, a free standing island that has a repurposed, old-fashioned feel with vintage style drawers and pulls is the right choice to feature in your kitchen. 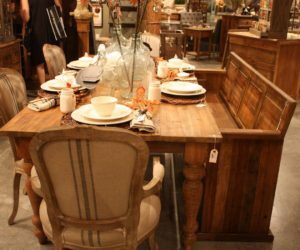 Whether you mix it with distressed wood pieces, or other natural-finish items, the point is to not be too matchy-matchy. 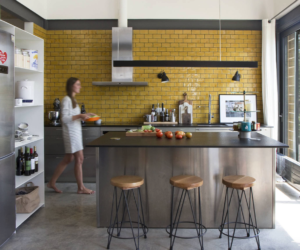 This style is made for mixing up the different elements. Still casual, yet a little more refined is this free-standing island from Park Hill, which could also be used as a very substantial sideboard in a spacious kitchen. 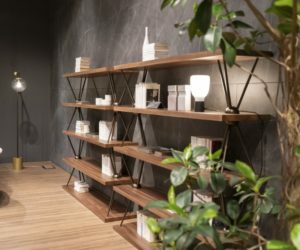 The solid wood and fully closed storage — with the exception of the bottom shelf — is a little more stately. 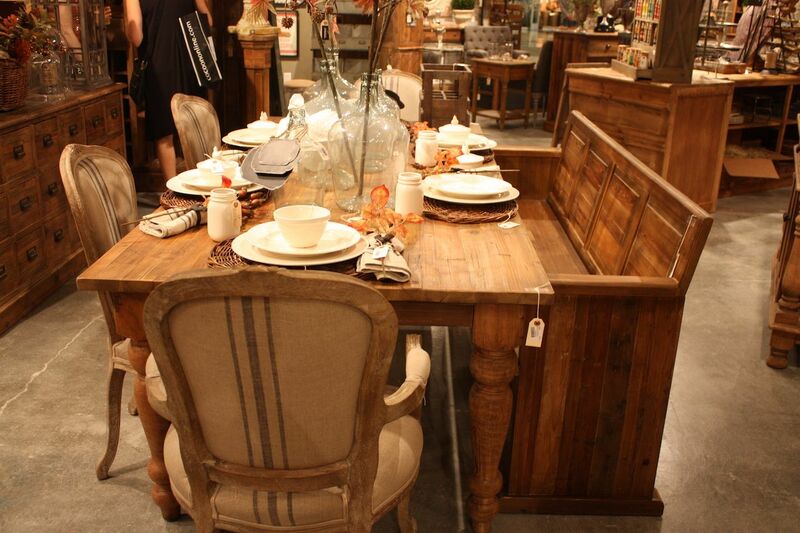 Because you can mix and match at will, your dining set doesn’t have to include all matching chairs. 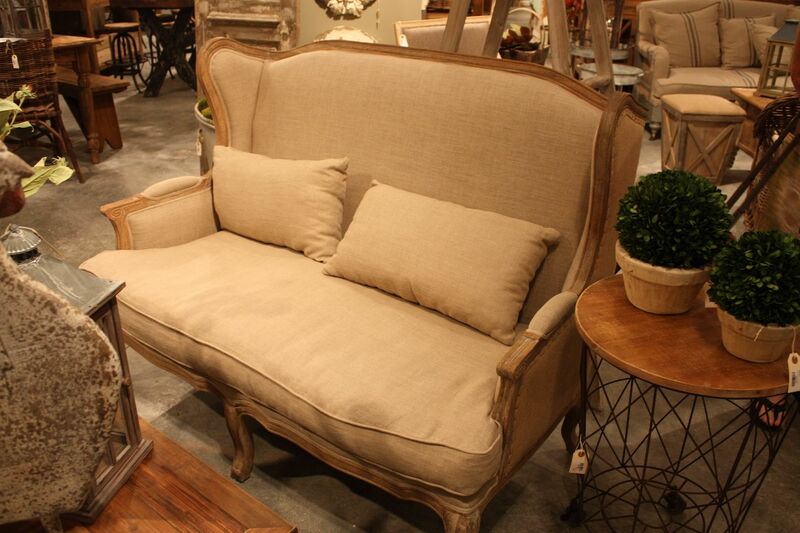 Country chic is a great style for showcasing an unusual or special pieces, like this pew-style bench. 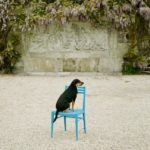 Teamed with upholstered chairs, or even other benches, it’s a wonderful way to express your love of eclectic pieces. 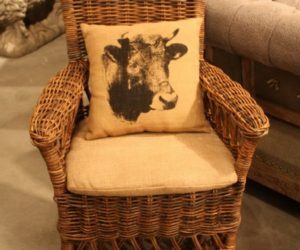 Upholstered seating is also a common element for country chic, and most often it has textiles that are neutral in color and casual in texture. 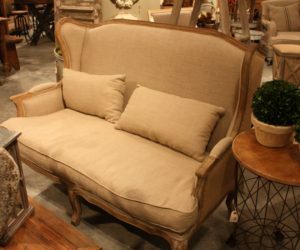 Pieces like this tall-backed love seat from Park Hill could easily be mixed with more colorful furnishings, such as those upholstered in a ticking stripe or an old-fashioned floral, if that’s your style. 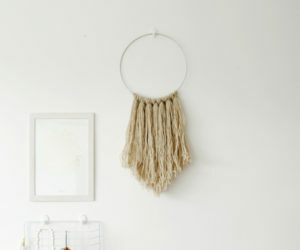 Of course, every style has room for a little bit of whimsy. 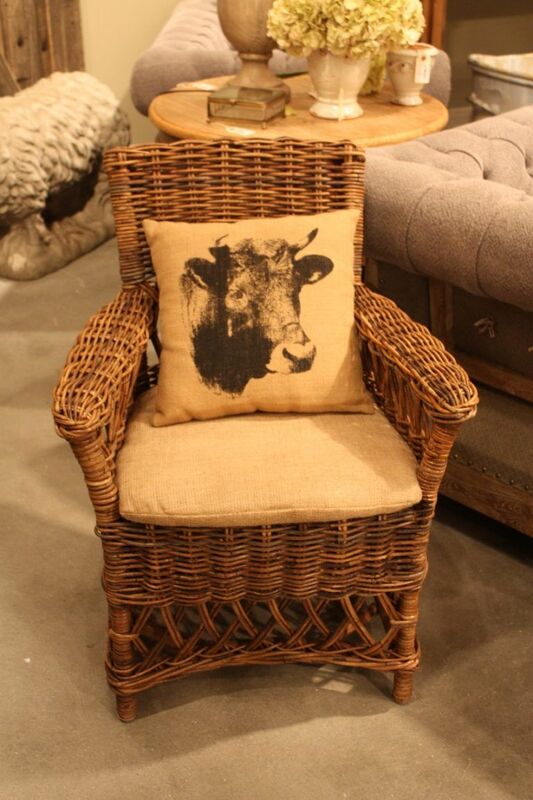 Here, Park Hill’s standard whicker chair has a neutral cushion and a fun pillow that sports a portrait of a cow. 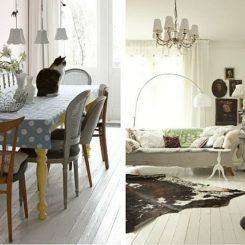 While it’s quirky, take note that the colors are still neutral, which helps it fit into the country chic style. 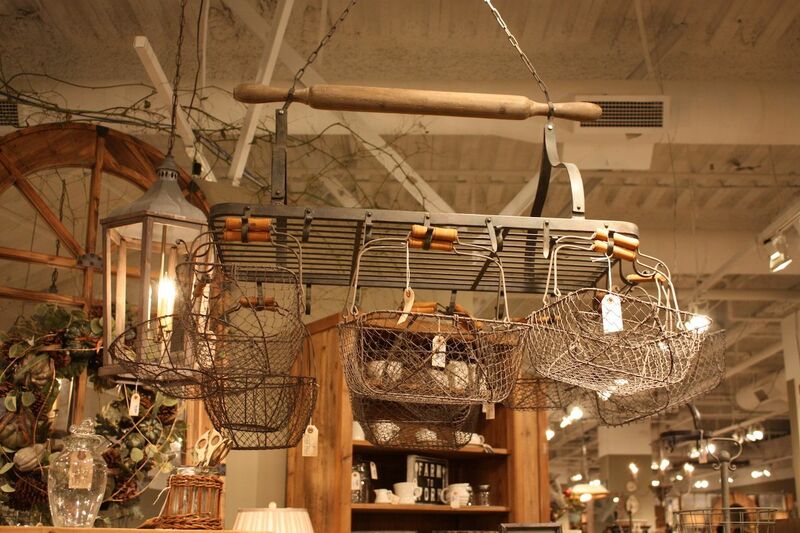 Accessories — whether they are quirky, vintage or rustic — play a big role in country chic style. 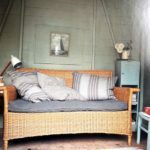 In fact, adding enough of these extras to a room that has only one or two pieces of furniture in the style can transform the whole look. 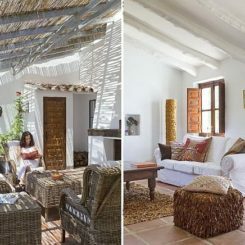 While there is room for color in this type of decorating, you’ll notice that neutral finishes, rustic materials and a preponderance of wood dominate the decor. 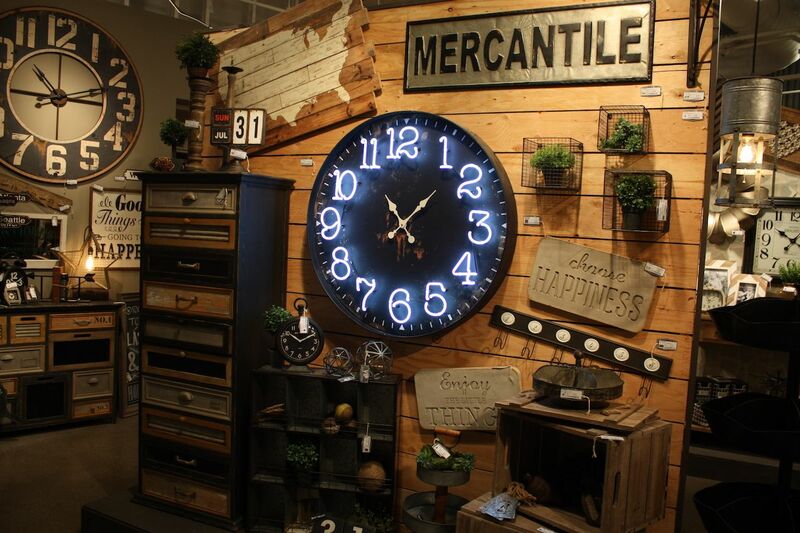 Judicious use of modern elements, like the neon numbers on the giant clock below, can make your room more distinctive. 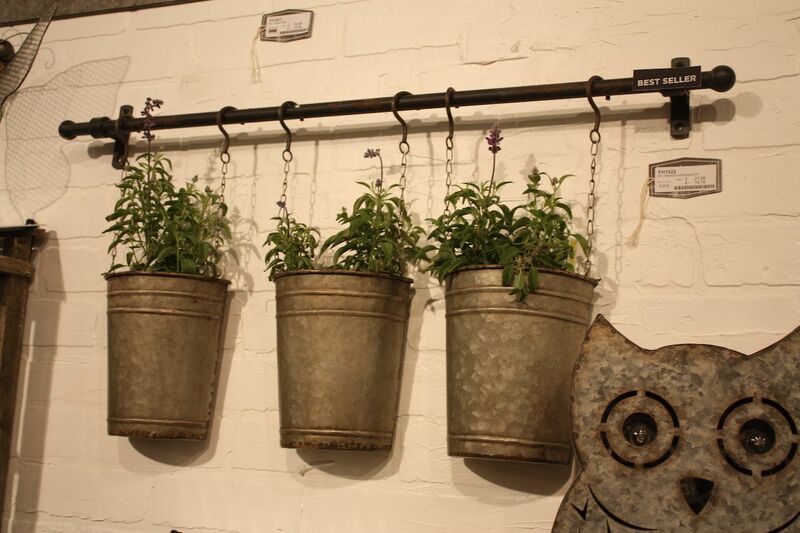 The collection below, from VIP Hole and Garden, includes a nice array of accessories. 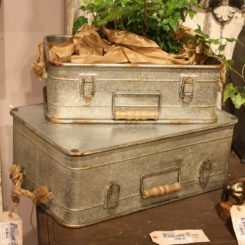 And, as with any style of decor, adding the element of greenery is particularly appropriate for country chic, especially when it’s paired with galvanized metal. 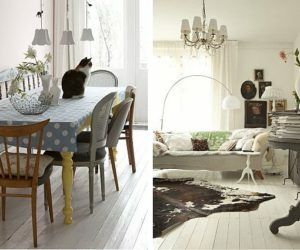 If anything, the country chic look is versatile and easy to recreate. 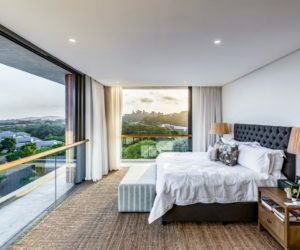 Just remember to choose the right materials, keep the basic color palette neutral, and mix and match to your heart’s content.